President-elect Donald Trump did not wait until taking office to upend decades of diplomatic protocol by accepting a phone call last Friday from Taiwanese President Tsai Ing-wen. The conversation was the first between leaders of the two countries since 1979, when the US ended diplomatic ties with Taiwan as part of its “One China” policy, which recognises Beijing as the sole legitimate government of all of China. 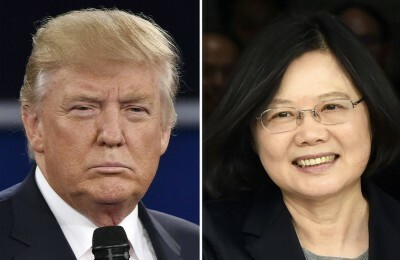 The decision to take Tsai’s phone call, nominally to congratulate Trump on his election win, was a deliberate and calculated provocation intended to set the stage for an aggressive confrontation with China across the board—diplomatically, economically and militarily. Trump lashed China in the course of the election campaign, threatening to brand it a currency manipulator and impose 45 percent tariffs on Chinese imports. He made few references, however, to the South China Sea, where the Obama administration has stoked up tensions in order to increase pressure on China, sending warships on three occasions within the twelve-nautical mile territorial limit around islets controlled by China. By hinting that his administration could forge closer relations with Taiwan and overturn the “One China” policy, Trump is recklessly inflaming one of the world’s most dangerous and volatile flashpoints and risking conflict with China. Beijing, which regards Taiwan as a renegade province, has stated that it will go to war to prevent a Taiwanese government declaring formal independence. The Washington Post pointed out that key figures within Trump’s transition team and incoming administration have strong links with Taiwan, including Trump’s designated chief of staff, Reince Priebus. He reportedly visited Taiwan with a Republican delegation in 2011 and again in October 2015, meeting Tsai before she was elected Taiwanese president this year. Taiwanese Foreign Minister David Lee has called Priebus a friend and described his appointment as “good news” for the island. By embracing Taiwan, Trump is threatening the “One China” policy put in place by President Richard Nixon and Secretary of State Henry Kissinger. Nixon’s trip to Beijing in 1972 coincided with a decisive sign of the historic decline of US imperialism—the August 1971 ending of dollar-gold convertibility, which had been the linchpin of the post-World War II economic order. By recognising Beijing and withdrawing support from Taipei, the Nixon administration secured the collaboration of the Chinese Communist Party regime in Washington’s efforts to undermine the Soviet Union. China’s de facto alliance with Washington was the prelude to the process of capitalist restoration, which accelerated after the collapse of the Soviet Union in 1991, leading to massive imperialist investment and the transformation of China, on the basis of super-cheap labour, into the world’s largest manufacturing hub. The expansion of China to become the world’s second largest economy and the relative decline of the United States have torn their partnership asunder. No longer able to maintain its hegemony through economic means, the US has increasingly resorted to military means since the end of the Soviet Union. A quarter-century of US-led wars is now coalescing into confrontations with nuclear-armed powers—China and Russia—that will be intensified under Trump. In reality, Obama’s “pivot” was a marked shift in foreign and strategic policy from the Bush administration, which had focussed on the Middle East to the virtual exclusion of the Asia Pacific. The Obama administration has been engaged in a comprehensive effort to isolate China, undermine it economically and encircle it militarily. This has included military provocations in the South China Sea, a refusal to negotiate with North Korea, and a $1.8 billion sale of arms last year to Taiwan. The heart of Trump’s so-called “peace through strength”—echoing President Reagan’s provocative and aggressive policy toward the Soviet Union—is a massive military expansion accompanied by a strengthening of alliances and strategic partnerships throughout Asia as well as trade war measures against China. Trump has pledged to expand the US Navy from 274 ships to 350 ships in order to maintain military supremacy over China in the Asia Pacific. Trump’s policy in the Asia-Pacific of “peace through strength” is a strategy not of peace, but war. With his phone call with the Taiwanese president, Trump has exposed the efforts of the media and political establishment to minimise the dangers posed by his election. His administration will be one of extreme nationalism and militarism, using any and all means to “make America great” at the expense of its rivals—especially China. Trump’s “Fortress America” is the prelude to a further eruption of US imperialism. Unless prevented by the revolutionary intervention of the international working class, it leads inexorably to world war.